Players draw property cards, token cards, house cards, etc. to complete their hand and go out. 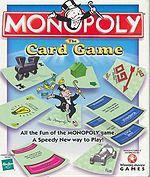 Monopoly: The Card Game is a card game loosely based on the board game Monopoly. The idea of the game is to draw and trade cards and organize them into "color-groups" and any number of bonus cards. Players take turns drawing and discarding until one player announces that he/she has a completed hand. The value of each person's hand is then counted and that person is dealt that amount of Monopoly money. The first person to collect $10,000 is the winner. The game was produced and sold by Winning Moves Games under a license from Hasbro, however it is no longer in production. The deck is composed of 60 cards. There are 28 property cards, which are exactly the same as the ones in the standard Atlantic City Monopoly game. Each of these cards (except the railroads and utilities) has a distinct color band on the top and the bottom, signifying the "color-group" to which it belongs. The card also displays the property name, the number of cards in its "color-group", and the value of the complete group and each house attached (which will be explained later). There are also 14 house cards and 2 hotel cards in the deck. You may "build" these cards onto any complete "color-group". You need not have all 4 houses and a hotel to go out, but if you do have any houses, they must be "built" in sequence (you can't use house 3 without having houses 2 and 1 also in your hand). Houses cannot be "built" on railroads and utilities. Each house is worth the same amount as the completed "color-group" upon which it is "built". Hotels are worth $500, regardless of where they are "built". Now comes a number of bonus cards which help increase the value of your hand. There are 6 token cards, each of which will double the value of your entire property set (including houses, if any). There are also 4 GO cards, each worth $200. Four Mr. Monopoly cards are also included. Whoever has the most of these cards at the end of the hand gets $1000. Finally, there are 2 Chance cards. Chance cards may represent any card in the deck needed to complete a set. Beware, though; these cards are only useful to the person who goes out at the end of the hand. If you have a chance card and someone else goes out, your entire hand is worth nothing, and you score $0 for the round. Score is kept with the pad of money enclosed in the box. Deal each player their amount of money after each round. TIP: It may be easier to keep score by writing each person's score down on paper instead of passing out money. This way, it is easier to see who is winning (so you don't have to continuously count it up), and you don't have to deal with the hassle of who cleans up the mess afterwards! Note: These rules are for 4-player games. Rules for 2, 3, and 5-6 players will follow. Each player is dealt 10 cards (face down, clockwise) by the dealer. In addition, the dealer places in front of each player another card face up. These are the players' discard piles. Cards in the discard piles are fanned so each player can see all the cards. The deck is placed in the middle of the playing area; this is the draw pile. The deal will pass clockwise. IMPORTANT: Remember that you must always have a total of 10 cards in your hand after your turn is over. DRAW If you choose to draw, take the top card from the draw pile and end your turn by discarding. TRADE You may trade any number of cards from your discard pile for the same number of cards in another's pile. If you would like, you may discard from your hand first to get the amount of cards you want. To trade, take the number of cards you want to trade and put them in the hand of the player you are trading with (they will have to discard extra cards from their hand on their next turn). You then take the cards you want from the top of that person's discard pile and place them in your hand. End your turn by discarding so that you have 10 cards. GOING OUT If your hand is complete - meaning that you have a full "color-group" with houses (if any) in order and there are no unmatched property or house cards - you may go out. On your next turn, discard any extra cards you have to make an even 10 and announce that you are going out. Play for this round has now ceased. The player who goes out gets the reward of the top 5 cards from the draw pile. He/she may use these cards if they help his/her hand. Before scoring, move all excess cards away. To score, count the values of each person's hand. Remember that any person with a Chance card other than the person who went out scores $0 for the round. The deal now passes to the left and the new dealer shuffles and redeals the cards. Play stops when someone gets $10,000. Take the top cards of both the "4th player's" discard pile and the draw pile and replace them with the top two cards of your own pile. TWO PLAYERS Same as a 3-player game except that two additional discard piles are placed instead of one. FIVE OR SIX PLAYERS For 5-6 player games, the game is slightly different. The whole deck is dealt out so there is no draw pile. For 5-player games, 11 cards are dealt to each player. For 6-player games, 9 cards are dealt to each player. A trading card is also dealt to each player face up. On your turn, you must trade cards with another player, and both players put the cards into their hands. Both players must then discard one card. After all players have gone once, each player passes one card to their left and puts it in their hand. Do this after each time around. Before players would normally pass a card left. The reward for going out are the trade cards on the table. The winner is the first to $7,000.